Book Flap: "Bestselling author Victoria Moran's Living a Charmed Life presents fifty action inspiring essays that show us how to custom craft our very own blessed lives. Covering topics such as living richly, staying close to what makes you come alive, and being completely, utterly yourself, Moran emphasizes that this kind of happiness is possible for anyone of any age in any circumstance. Living a charmed life is your birthright, one that you can start to claim as soon as you take to heart--and put into action--the practical and spiritual tips you'll find here. These lucky charms, honed from Victoria's own life experiences, will elevate your attitude, change the way you see yourself, and help you to improve every aspect of your life including your health, relationships, finances, and peace of mind--even in challenging times. In this fresh, inspiring book, Victoria Moran gives you the tools and techniques you need to start living your own charmed life now." I'm generally not a fan of self help books but when Caitlin of FSB Associates asked if I would like to review Victoria's book, I said yes. "Living a Charmed Life", written by inspirational speaker and certified life coach, Victoria Moran, gives you practical advice and suggestions for living a better life. Surprisingly enough, I discovered I already use most of the tips suggested, such as - be yourself, positive affirmations, savor your alone time, think positively, not feeling guilty, just be in the moment whether you are washing dishes or exercising. Also tidbits about detoxing your body and your life, The 50 chapters are short essays of about 3 to 5 pages and include personal tidbits about Victoria's life and how she incorporates living a charmed life. Other suggestions that I hadn't thought about- Adding a splash of red to your life, whether it be clothes, home or office. "Red is the charmed-life color because it lets the world know that you're here and that you deserve some attention." or write yourself a life list of things you want to do and refer to it often. She quotes a favorite author of mine, Napoleon Hill who wrote "Think and Grow Rich" who said "If you can conceive it, you can achieve it." Similar to a bucket list of things you want to do before you die. 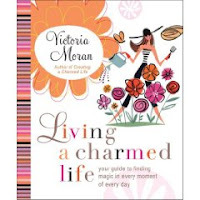 If you need some inspiration in finding a bit of magic in the everyday moments in life, check out Victoria Moran's "Living a Charmed Life." Also check out her blog at Belief net for some daily inspiration. Thank you Caitlin for providing the review copy.